Summary: For Claire Boucher, life is all about skating on the frozen cow pond and in the annual Maple Show right before the big pancake breakfast on her family's farm. But all that changes when Russian skating coach Andrei Grosheva offers Claire a scholarship to train with the elite in Lake Placid. Tossed into a world of mean girls on ice, where competition is everything, Claire realizes that her sweet dream come true has sharper edges than she could have imagined. Can she find the strength to stand up to the people who want to see her fail and the courage to decide which dream she wants to follow? Our review: The protagonist in Sugar and Ice is Claire Boucher, 13, has a passion for ice skating, but also a love for her family and their maple syrup farm. She is afraid of skating in front of judges so her skating is more of a beloved hobby she does on a frozen pond. Until she is discovered by a scout at her town's Maple Festival. So when she is offered a once-in-a-lifetime chance to train at Lake Placid Olympic Training Facility, she can’t help but accept it. (I mean, seriously, who wouldn’t?!) Even if her new life means she has absolutely no free time at all and she has to give up things she loves like spending time with her family, and even her best friend. Claire must decide how far she’s willing to go for her dream. Part of her dream also has some negatives, like the mean girls she encounters at the training facility. Can Claire rise above the bad things in order to attain her passion? I'm not spoiling the story. I will say Claire was a lovely character. Reading about her skating experiences-both good and bad-were enjoyable. The setting was so well described I could smell maple syrup and hear the scrape of skates across the ice Messner's words were so alive. The supporting characters were just as good. I was surprised (in a good way) when I read that Claire’s friend Tasanee liked to read paranormal YA! I couldn’t believe how realistic the characters seemed. Sugar and Ice was a wonderful tale of family, love, friendship, and going after our one big dream. This is a great story for anyone of any age—even if you’re not a fan of ice skating or maple farms! "Claire smiled a little. "I know." She was stronger. And she'd choose her own dreams from now on. She had a bunch of them to get started on. "Thank you for everything." 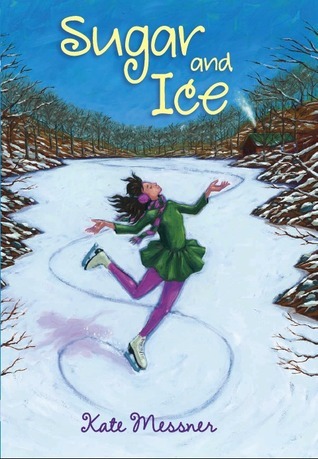 Cover Comment: The cover was a cute picture of Claire skating. This is a great review and I think I want to read this book sometime. This book is a GREAT book! I have read it for my school book report and it was AMAZING!!!!!!!!!!! I thing Kate did an exelent job at writing this book! Sugar and Ice is a book for any age. Read it sometime!